The Facemask Appliance is a one-piece unit comprised of a stainless steel framework (central core) with adjustable forehead and chin pads as well as a “cross piece” that attaches directly to an intra-oral (in the mouth) appliance to bring the upper jaw forward and downward. 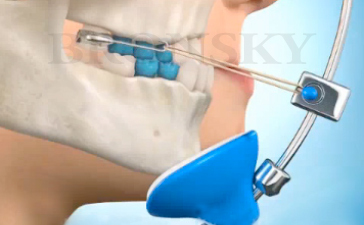 The Facemask Appliance is used in patients that present with a “Class III malocclusion” or “underbite”. The body does most of its daily growth roughly between 6 PM and 6 AM—the greatest degree of Facemask wear between those hours tends to yield the best results. Placing the appliance before or immediately following dinner up until snack/bathing and then all night will optimize results. The Facemask can be cleaned with a damp cloth or with any kind of disinfection pads (“Wet Ones ®” and the like). 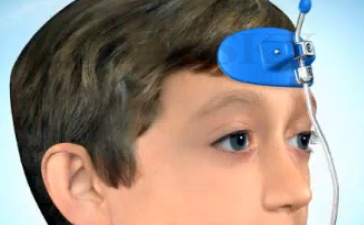 The forehead and chin pads can be replaced with new pads and are often more comfortable when lined with “Dr. Scholl’s Moleskin®”. As with any appliance, there is a short adjustment period as the teeth may experience some minor soreness as the body acclimates to the appliance. We suggest increasing time with the appliance gradually starting with 1 hour and adding an hour per day until the patient is comfortable with wearing the appliance for the desired interval. Any standard pain medication can help during the adjustment period but is not necessary thereafter. If the appliance is placed immediately before bed, it can often create more soreness than is necessary, prompting “unconscious” removal by the patient. Placement of the appliance as early in the evening as possible is key to success!! !